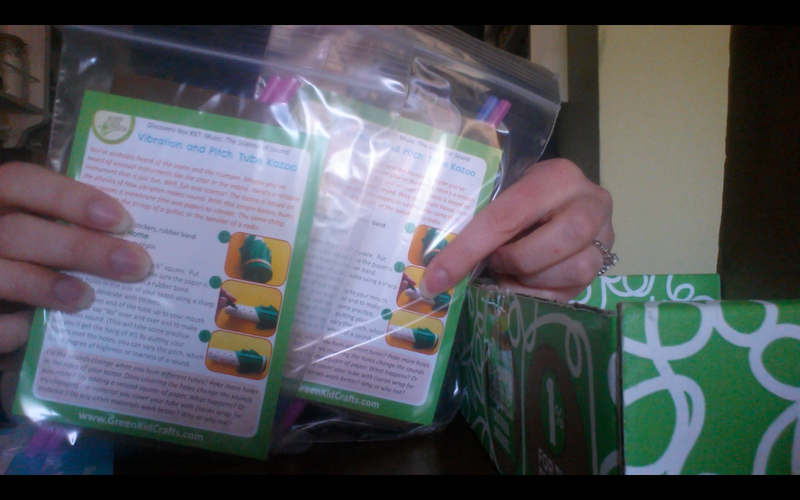 Awhile back, our family decided to try out Green Kid Crafts, which is a cool subscription box for kids. You get a science & craft kit in the mail every month! 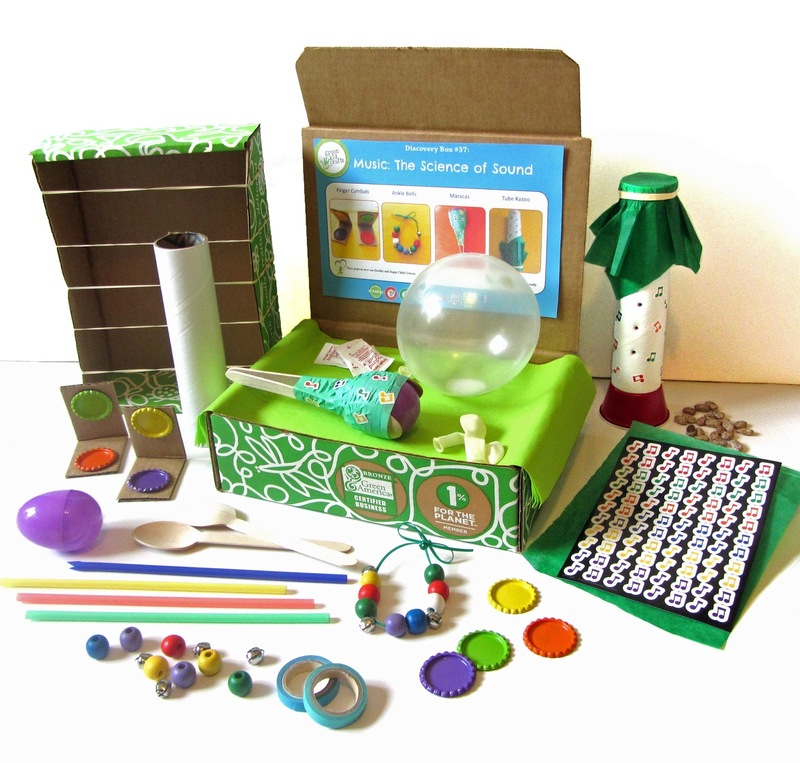 Green Kid Crafts sends your family a box focused on STEM and arts and crafts, full of multiple projects for fun with learning, experimenting, and crafting. Here I'm giving my unbiased review of the service and showing you what's in a typical box. You can skip to the end for a COUPON CODE to use (perfect gift for the holidays — hint, hint). Full disclosure here: Green Kid Crafts links are affiliate links. Green Kid Crafts did not sponsor this review in any way, and I paid for my own subscription. I do have a previous advertising relationship with Green Kid Crafts, but that is not current. The end! First, I'll share my videos if you're a video-watching type. Below those, I'll give a mini written & photographic review if you'd rather have still action. We made a tube kazoo, a straw kazoo, a rubberband guitar, plastic-egg maracas, jingle-bell necklaces, and a balloon drum! My older kids (3 and 7 then) had a lot of fun. Our 5-month-old at the time (ack! time flies!) 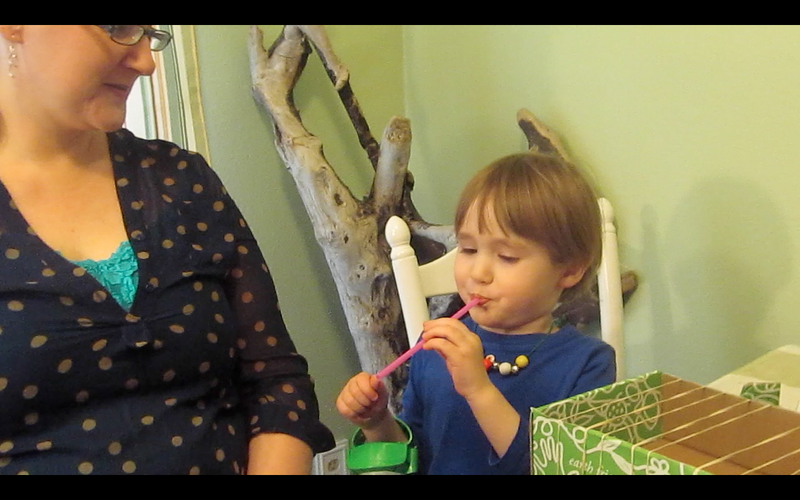 mostly protested the entire video but did enjoy slobbering on some handmade instruments. What I love about Green Kid Crafts is the fun of receiving an educational box in the mail every month. The projects are a lot of fun, and they're geared toward learning, so what's a parent not to love? 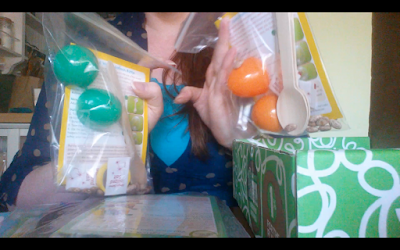 All the supplies needed are in the subscription box, and since we sprang for the Sibling Add-On, we had enough for our two older children, avoiding sibling squabbles. I really love not having to gather supplies to complete projects — it's so convenient to have it all handy like that. For instance: Need salt for a project? They include little salt packets. Need glue? They include glue dots. I think the only additional supplies we needed were scissors. They don't expect you to scrounge up anything, which makes it a lot more convenient than trying to manage something off Pinterest at a moment's notice. All the supplies are neatly bagged and included. The projects were simple to complete for my three-year-old and seven-year-old with a parent helping. Our completed creations didn't look exactly like the examples in the pictures, but I figure that's ok! We had a lot of fun putting them all together, and we're used to being #craftfails. There was an educational component included with the cards that came with each project. You could talk and experiment more with, in this case, the science of music and sound. Detailed cards give project instructions and further learning opportunities. My takeaway is that Green Kid Crafts is very arts and crafts-oriented, which will suit many children. My kids (especially Mikko) are a little more science-oriented, so they don't get into the crafting as much. I would have loved kits like this as a kid, but I think I'll try some more STEM- and maker-themed kits next to see if I can engage Mikko a little more. For instance, if you have a kid who loves crafts and resists science and technology, this might be the perfect gateway. If you have a kid who's more of a maker and less of the artsy sort, this might be a bit too much decorating and designing (as was the case for my kiddos). It was also a bit confusing that multiple projects were in the same baggie, but that did conserve on baggies. It might help you to separate out the materials ahead of time so your kids aren't distracted or confused by items you're not yet ready to use. The supplies themselves were good quality and worked well to complete the projects. I think the price at about $19.95 a month is fair for the amount of projects you receive and the convenience of having a themed kit delivered to your door, with all the supplies included. It would certainly make a great holiday gift, birthday gift, or wish-list item to show the grandparents. I really appreciate that the company is a small business that's mom-owned and -operated. 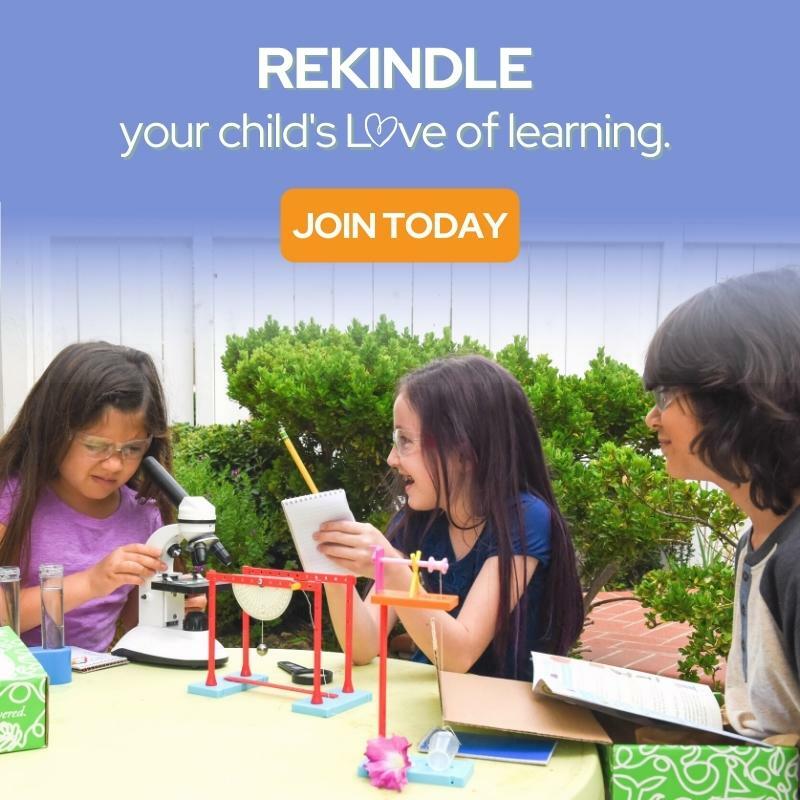 I love supporting parent-centric businesses like this, run by people who care and know what kids and their parents really want. I also like that, true to its name, Green Kid Crafts tries very hard to be ecologically responsible and a good steward. Check out Green Kid Crafts for monthly subscriptions or single purchases. 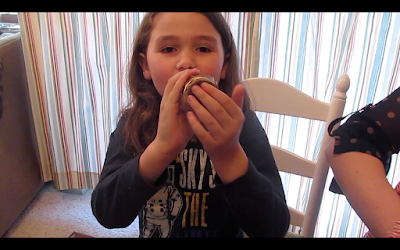 This is a perfect fun but educational resource for homeschooling families or those looking for additional craft projects or science immersion. It's geared for ages 3-10 years old and will be a happy surprise in the mail for everyone in the family. Order a single box or a subscription for your children or as a gift. A helpful feature is the reduced-cost Sibling Add-On if you have multiple kiddos. Use my exclusive coupon code below for 50% off your first box! the first month of a new subscription!